Apparently I still haven't said everything I want to say about quilled birds... I hope you can tolerate one more post! While compiling the recent round up of feathered friends, I realized I've made quite a few duck projects, so I've gathered the entire flock to give you some ideas. Whenever I need to make a baby card, shower invitation, or framed birth announcement, ducklings are my very favorite thing to quill. They're quick to do and pretty darn cute. 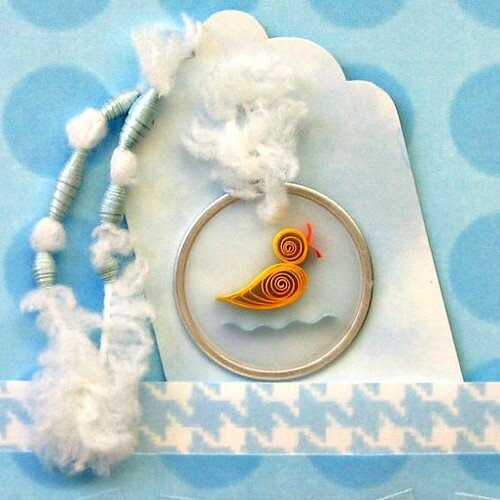 The card features a little quacker on a swinging vellum disc. The supply list looks intimidating, but if you're a paper crafter, odds are you already have most on hand. 1. Adhere one of the patterned papers to the front of a 4 x 6 inch white card. Tips: If you would rather print your own papers, Google free baby-themed digital scrapbook paper. I chose polka dots, hounds tooth, and clouds, but you'll find many choices. 2. Cut four 3/4 inch squares from patterned paper and stamp a letter on each square to make BABY blocks. 3. 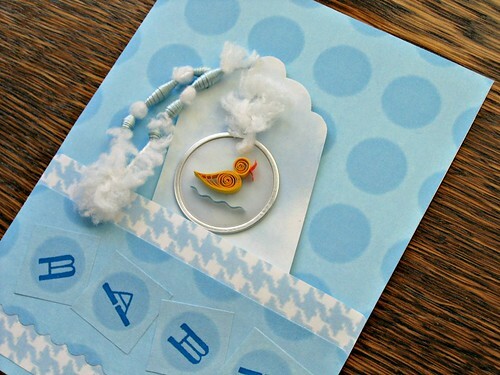 Print a tag on card stock (Google scrapbook tag template images to find a shape you like), cover with patterned paper, and punch a small hole near the top of tag. Also punch a hole near the edge of vellum disc. 4. Make the quilled duck: Roll one 4-inch bright yellow loose coil (roll strip on quilling tool, allow it to relax and glue end) as the head and one 8-inch bright yellow curved teardrop as the body (roll a loose coil, pinch to a point, curve tip slightly with fingers). Glue head and body together as pictured. Make beak: Cut a 1/4-inch strip of orange paper in half lengthwise. Fold one of the strips in half again and curve ends as a beak. Glue fold to head. 5. For the water, crimp a 1-1/4 inch x 1/8-inch piece of light blue pearlized paper. 6. Glue duck and water on vellum disc as pictured. 7. Make a half dozen light blue pearlized beads in different sizes. To make a bead: Cut a long, narrow triangle and roll it on a stiff wire (I use a cake/muffin tester from my kitchen drawer) from the wide end to the point; glue end, and thread onto yarn. Tie yarn onto the vellum disc and tag, allowing disc to swing freely on the tag. 8. Cut a strip of one of the patterned papers and a narrower strip of another. Cut lower edge of narrow strip with scallop scissors. Center and adhere this strip on the first. Adhere BABY blocks as pictured. Adhere just the ends of first strip to card to create a pocket of sorts. 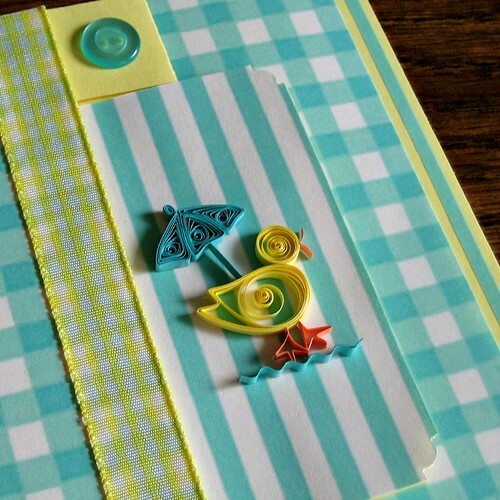 Slip lower edge of tag under paper strip and adhere tag to card with adhesive foam dots. 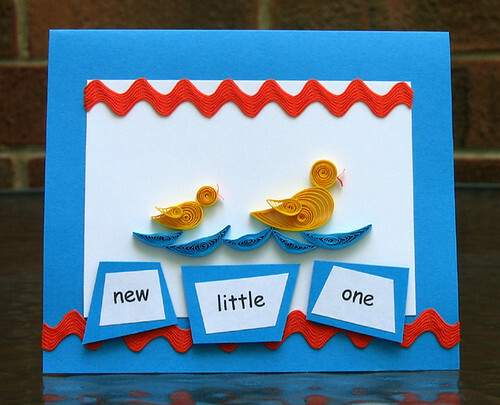 For some other duck ideas, here's a quilled birth announcement that features a whole family swimming along. The new baby is making quite a racket as he paddles furiously to keep up. 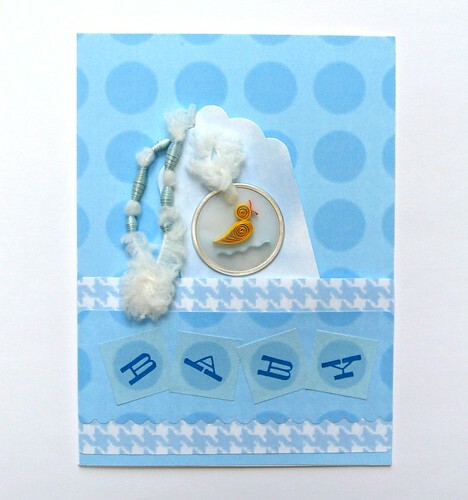 A previous card tutorial - cute to use as a baby shower invitation or to go with a shower gift. Lastly, an idea that works as either a birth announcement or a congratulatory card. 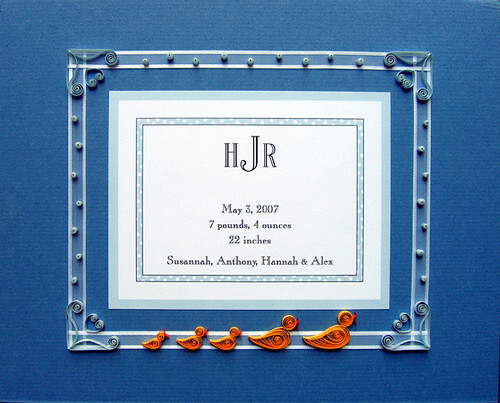 The pattern can be found in Creative Paper Quilling. Have fun making something ducky! These little ducks are so cute! ann...i love your collection ofvquilled birdies! i especially like your swing tag bird and the decorative yarn you have used in your design. i do fancy the birdie with the umbrella...great colours and design siutable for either male or female. Your little duckling looks adorable . You make the simplest cards so elegant. I love your paper beads.